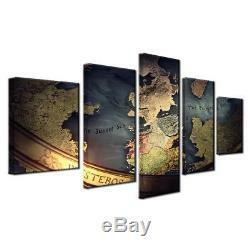 5 Panel Game Of Thrones World Map Print Mediterranean Wall Art on Canvas Framed. BEFORE PURCHASING your panel wall art on canvas, please know the difference between " Framed " and " No Framed ". You can read info and details below the images in the gray tables. Please also note the size you are purchasing. Most are available in SMALL 40" width, while some others have 60" and even 80 options. 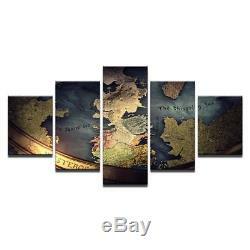 5 Panel Game Of Thrones Map Print Mediterranean Wall Art on Canvas Framed UNframed. We have 2 options for this print-- With Framed, Or No Framed. Means the print has been stretched on wood frame, ready to hang! You or someone local will need to install the canvas on stretcher bars in order to hang your wall art like in the picture. Please note, this home decor panel wall art picture is a print and not a painting. Use the sizes listed below for reference. Images do not depict actual size of print. Size :10x15cmx2,10x20cmx2,10x25cmx1 (4x6x2,4x8inx2,4x10inx1) - MINI Print size1:20x35cmx2,20x45cmx2,20x55cmx1 (8x14x2,8x18inx2,8x22inx1) - Small size2:30x40cmx2,30x60cmx2,30x80cmx1 (12x16x2,12x24inx2,12x32inx1) - Medium size3:40x60cmx2,40x80cmx2,40x100cmx1 (16x24x2,16x32inx2,16x40inx1) - Large 84 installed width. Please see our "World Map" category to see this print in 1 and 3 panel prints. Get first dibs on our sales! Be sure and see our website even more of a selection (ASH Wall Decor). You can also see some "reviews" on our prints/products. READ FIRST BEFORE PURCHASING Info on SIZE of your Wall Art along with FRAMED and NO FRAMED options. "Framed" and "No framed" INFO. Means the painting has been stretched on wood frame, ready to hang wall art! This is the BEST value on most prints considering the cost for the stretcher bars PLUS the cost to install the canvas. Use the measurements included above as the measurements you need to go by. Example of measurements listed with some of our wall art ads. Size : 20x35cmx2pcs, 20x45cmx2pcs, 20x55cmx1pc (8x14x2, 8x18x2, 8x22inch) (width x height x number of panels) The size above = 40" total for the 5 panels - Installed would be approx 44" wide including spacing between panels. Most prints we offer range from 44" to 84" installed width. "Installed width" includes 1 between each panel. Please use the measurements included with the ad to measure the area on your wall and make sure the size you choose is the size that you want. 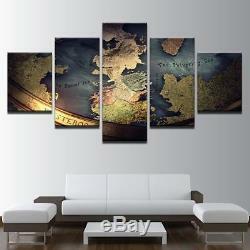 DO NOT expect your wall art to resemble the size depicted in the images on the ad. Go by the measurements provided. We are not held responsible for any inaccuracies in the title descriptions. I add descriptive titles that fit the print to the best of my ability. We have larger HD images showing print renderings (not actual prints) so please look at these closely before purchasing. Well ASH is our awesome daughter Ashlee. Our one and only child. My wife Jody and I were married October 5, 1985 and Ashlee was born in 1987. We all live in Pinellas - Largo, St Pete, Clearwater, FL area. ASH Wall Decor offers hundreds of modern abstract wall prints and paintings (and other wall decor) that will make a great impact on the look of your living room, bedroom, family room, garage, man-cave, office, workshop or anywhere else that has a painted wall. All our prints and paintings are on canvas (no board). The canvas is stretched on stretcher bars. Most of the prints we have listed are custom made (we do have a limited number in stock). Please allow slightly more for hand painting paintings or our custom made prints. Com/ashwalldecor/ be sure to "Like" our FB page!!! 23000+ truck, car and custom motorcycle paint job pics in our Gallery! We LOVE motorcycles and ART! You can "Shop" on our FB page. We assure you your package is on the way. "Processing" is normally less than 7 days. We are a distributor for several retailers. If the box is damaged, please pack in another box to prevent further damage. We will work with you to correct the issue, if within reason. Our feedback and reviews mean a LOT to us. Satisfaction : Your satisfaction is very important to us! If you have any problem with your order, please do not leave negative comments. We are a small family-owned business trying to make it, not a huge company that doesn't care We will ALWAYS do our best for you! Thank You - Scott / Jody / Ashlee ASH Wall Decor. 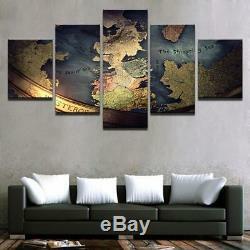 The item "5 Panel Game Of Thrones World Map Print Mediterranean Wall Art on Canvas Framed" is in sale since Saturday, April 21, 2018. This item is in the category "Home & Garden\Home Décor\Posters & Prints". The seller is "ashwalldecor" and is located in Mainland. This item can be shipped worldwide.